Photo by Peter Bauer. Scenery as seen from viewpoints above Lyman Lake. Attractions: Holden Village is a fascinating town at the start of this hike. It’s cut off from roads (accessible only by boats or planes) and acts as a spiritual retreat for the Lutheran Church. Beyond the town lies Hart Lake at the foot of big mountain walls and, higher up, Lyman Lake at the foot of receding glaciers and the towering Chiwawa Mountain. Length: 10 miles from Holden Village to Upper Lyman Lake. Elevation Gain: 2,400 vertical feet to lower lake, 2,800 feet to higher lake. Difficulty: 2. Intermediate fitness needed if done as a two or three day backpack. Advanced fitness to go from Holden Village to Lyman Lake as a day trip. Skill: 2- (lower intermediate). Good trails leads to Lyman Lake. 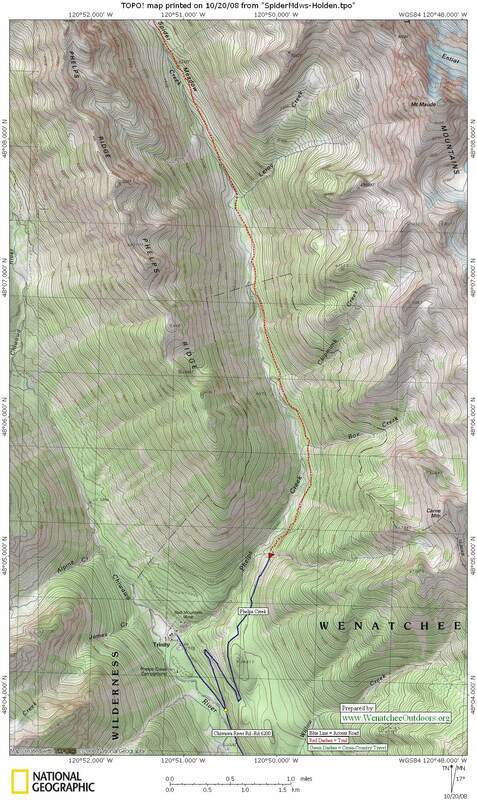 The traverse to Phelps Creek Trailhead (mentioned below) requires considerably more skill (it’s a fairly easy route for mountaineers but an advanced hike). Access. Drive to Fields Point Landing (beside Twenty-Five Mile Creek State Park) half way up Lake Chelan (on the south side of the lake) and catch the ferry (Lady of the Lake) to Lucerne. Take the bus to Holden Village operated by Holden Village. Walk to the west edge of town and just keep following the road about 0.9 miles to the trail heading up Railroad Creek to Hart Lake. Trip Instructions. From the trailhead, follow the trail up Railroad Creek 4 miles to Hart Lake. From Hart Lake, it’s about 4 more uphill miles to Lower Lyman Lake. Don’t call it quits at the north end of the lower lake because you’ve just reached the prettiest country. Make sure to walk around the east side of the lake and hike another mile to Upper Lyman Lake. Then walk one more mile beside tarns and through alpine meadows to foot of the Lyman Glacier. 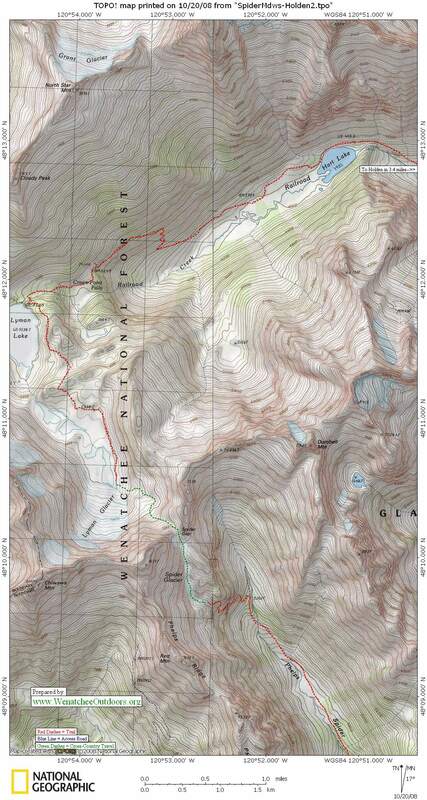 Maps: Topo of Hart and Lyman Lakes and the rest of Spiders Meadow traverse. Other recommended trips near Lyman Lake. 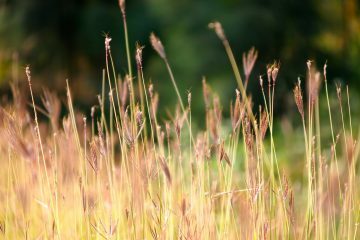 · Many people like to visit Lyman Lake, Hart Lake, and Holden Village by starting at the Phelps Creek Trailhead, walking to Spider Meadows and then coming over Spider Gap to reach Lyman Lake. 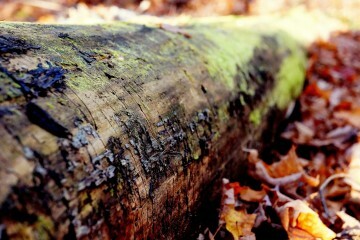 Details in our guidebook for that traverse. Holden Details. Contact Holden Village by voicemail (# in the phone book) to reserve a bus ride (about $10) from where the ferry lands in Lucerne up to the village. In 2008 the bus makes two trips a day between the village and the ferry. Also, in 2008, lunch at the village was $7. Ferry Details. Check the daily ferry schedule and reserve via the internet or by phone (www.ladyofthelake.com, 509-682-2399). The ferry can be caught in Chelan or up lake at Fields Point Landing. We recommend the latter (cheaper, more parking, faster). 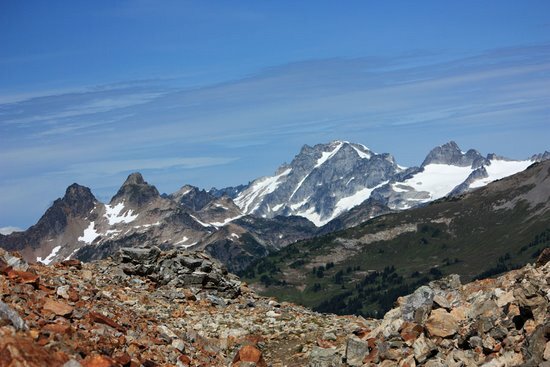 Not allowed: Most of the trip is in the Glacier Peak Wilderness so all regulations applying to wilderness apply (e.g., no motorized or mechanized vehicles). 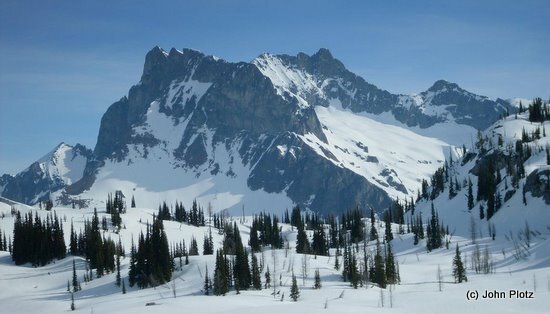 Updated Trip Reports: Condition updates about Hart / Lyman Lake hike (WTA.org) and condition updates about the Spider Meadows Traverse (from WTA.org).